DrC calls it deferred maintenance. I call it B.O.A.T. days. We keep buying stuff. We keep fixing things. Spending money is becoming a way of life. I really want this phase of preparing for the Puddle Jump to be over. The combination of no income, downward spiraling economies, and repeated hot exposure of our credit cards to merchants all over La Paz is causing me to lose sleep and burn holes in my stomach. My good friend Behan (s/v Totem) reassures us that this is a temporary phenomena and must be done to keep us safe and happy. I know she is right… and I know this at both the intellectual, objective level as well as the instinctive twitchy level. When I was a whipper snapper n00b five years ago and almost divorced my husband on the spot when he spent an insane amount on our windlass, I was in error. Yelling about all the purchases of books, parts, oils, and tools over the year was a mistake. The Toast of today preparing for the jump does not complain to DrC while paying the Visa, Defender, West Marine, Moore Medical, and Gallery Marine bills. All of these decisions are the correct ones. 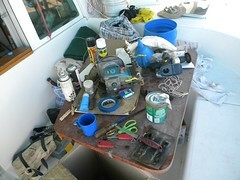 Haul and paint the boat and replace the sail drive seals. Get the third reefing points added to the main. Replace the 200' of G40 chain with new chain, not used. Keep only the best 100' of the old chain for the stern hook. Get the second computer, the GPS units both USP and handheld, the extra paper charts, and the backup radio units. Load nearly 6 months worth of staple goods and household supplies, deferring only the purchase of fresh items for the crossing. Add diesel and water capacity to the boat and get a replacement throttle head for the outboard. Pay the stainless steel guys to build the frame for the wind generator and buy that second pair of blades from Maitairoa. I do not regret any single purchase. However, collectively we are spending more in six weeks than we did in the prior six months. 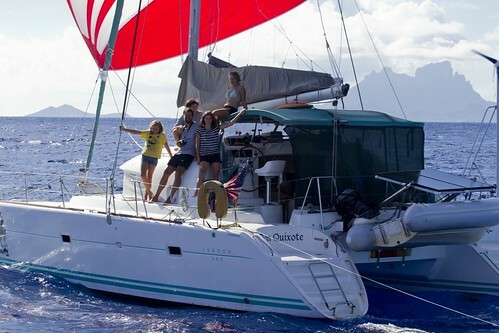 We are spending more specifically on Don Quixote than we have in five years… which is probably why DrC is correct; Many of the additions, changes and fixes are simply deferred maintenance on a cruising sail boat. Other major purchases are specifically and solely for disaster mitigation and recovery which -- I admit it here publicly -- we should have undertaken prior to leaving Elliot Bay in Seattle. Mea culpa. On the the hand, I read the news and listen to the Morning Talk here in La Paz and recognize a simple truth: the Zombie Apocalypse started years ago. I don't know why DrC and I thought we were preparing for its coming when in reality it started long ago. Like a frog slowly being brought to a boil, we weren't paying enough attention to get out of the pot before getting hurt. Now, however, I go online to transfer the last of my US dollars into my visa to pay off bills to Amazon, Seattle Fabrics and Fisheries Supply and reassure myself that I'm buying the nautical equivalent of gold. These things we are investing in are portable wealth. And unlike gold, Don Quixote can sustain us and feed us. She provides shelter, water, power, and sewage disposal. She is a form of safety net. On the whole, we are very fortunate. When all is said and done, we'll have a well-equipped, well-founded sailing vessel which we can take nearly anywhere. The boat will be stocked with enough food and supplies to keep us going for a half year, longer if we push it. With the oil market going berserk in the face of revolutions throughout the Arab world, I think it's time the Conger family started going all Purist Sail-All-the-Way rather than loading up on more jerry cans.